WILLEMSTAD – The Parliament of Curaçao has adopted the bill “Ordinance international assistance in the field of taxation” yesterday with 11 votes in favor and 3 against. The opposition party MFK voted against the bill. When no one had signed to speak for or against the law, the President of Parliament went immediately to the voting. The MFK party, then requested a roll call vote, which gives them the opportunity to motivate why they are against the bill. 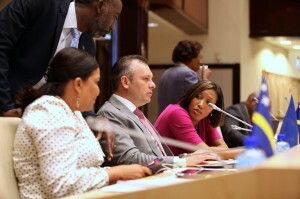 The leader of the opposition party, Gerrit Schotte then stated that the Advisory Council has indicated that there are many holes in the law. “The privacy of exchanging information to the United States and Europe without repercussion is being trampled. Civil Servants and Ministers can just send information and there is no way to control that. In addition, the Committee Protection Personal Information is not staffed,” said the MFK leader. With the adoption of the ordinance, the obligation to exchange tax information with the United States and Europe, through the Netherlands, is now supported by law.